The Dingos' 2016 social calendar will kick off this Saturday as the team heads to the Air Canada Centre to watch the Toronto Marlies take on the Portland Pirates at 1:30pm. 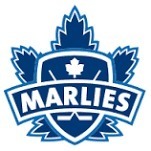 Marlies games have become marquee events on the club's calendar, and this will be the fourth successive season that the Dingos have taken in an AHL game. The Marlies are currently sitting in first place in the AHL's Eastern Conference, with a handy 12 point lead over the next best team, the Wilkes-Barre/Scranton Penguins. The Pirates are in fifth place in the Eastern Conference, with a 29-18-1 record. Saturday's game will be a great chance to get a look at some of the Leafs' up and coming stars, with William Nylander having recently returned from a concussion he sustained in the World Junior Championships, and recently acquired Tobias Lindberg lacing up the skates in what will be his fourth game for the team. The day will be bookended at nearby pubs, as 25+ Dingos celebrate the beginning of the club's 21st season. If you're interested in joining the Dingos on Saturday, or for the 2016 season, please contact recruiting@torontodingos.ca.